Movado is a well known watch brand, but what do we know? We know the Museum Watch. We definitely know a Museum dial, when we see one. These watches have been Movado’s defining symbol, for as long as I can remember, but what of the Movado…before the Museum? The Museum dial was designed in 1947, but by then Movado had been in business for many years, and created many important timepieces, so what has happened to these vintage pieces? 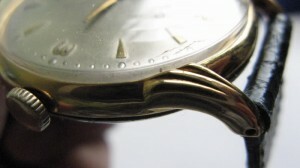 Looking on line and you can locate many rare and highly collectible Movado watches from the early to mid 1900’s. These creations are beautiful, and their quality is unmistakably Movado. As I said, this Swiss watch maker came long before the Museum watch did. One such find, is the Movado Women’s Bracelet watch, circa 1960. This watch was crafted in 14 carat yellow gold, and has really contemporary styling. It is modern and stylish, and features a rectangular dial, made of Mother-of-Pearl. The delicate arms and minimalistic face of this women’s watch is in keeping with Movado’s design elements. This watch is a mechanical movement, and Swiss made. It offers a bit of color, in its’ blue jeweled cabochon crown. There are many of these fabulous estate finds, so the next time you think of Movado, remember they are more than their Museum watches.